Eggo is a popular brand of frozen waffle made by Kellogg Company since 1953. The name comes from the eggs in the waffles which provide a taste that’s distinct from a regular waffle. 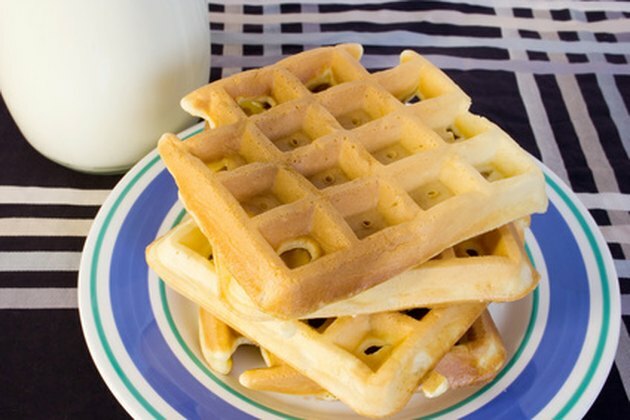 Eggo waffles come in several different varieties and are commonly available from any store that sells frozen foods. The primary ingredients of Eggo waffles are enriched wheat flour, vegetable oil, eggs and baking soda. These ingredients are mixed into dough, which is allowed to rise. Eggo waffles are cooked by the manufacturer before they are packaged, so the customer only needs to heat them. One serving of Eggo waffles is two plain Eggo waffles weighing about 1 oz. each. This does not include butter or syrup. A serving of Eggo waffles has 190 calories. This provides 9.5 percent of the daily value (DV) for calories, assuming a standard diet of 2,000 calories per day. Carbohydrates account for 104 calories, fat provides 70 calories and protein contributes 16 calories. A serving of Eggo waffles contains 27g of carbohydrates, which is 9 percent of the DV for total carbohydrates. Dietary fiber comprises less than 1g of this total and provides 3 percent of the DV for fiber. A serving of Eggo waffles contains 2g of sugar, which is 4 percent of the DV for sugar. A serving of Eggo waffles contains about 7g of fat, which is 11 percent of the DV for fat. This includes 2g of saturated fat, which is 10 percent of the DV for saturated fat. A serving of Eggo waffles also has 20mg of cholesterol which is 7 percent of the DV for cholesterol. A serving of Eggo waffles has about 4g of protein, which is 8 percent of the DV for protein. Each serving of Eggo waffles contains 430mg of sodium, which is 18 percent of the DV for sodium. A serving of Eggo waffles has also been fortified with 20 percent of the DV for vitamin A, iron, thiamin, riboflavin, niacin, vitamin B6, vitamin B12 and phosphorus.